Pro Tour Hour of Devastation kicks off from Kyoto, Japan, this weekend! Follow all the action on twitch.tv/magic beginning Thursday at 5 p.m. PT/8 p.m. ET/midnight UTC. Oh boy has Hour of Devastation shaken up the Limited format! The Pro Tour is in Kyoto, Japan, and is coming up right around the corner, and the players are scrambling to re-assess this new environment. The first thing that will jump out to you compared to the previous format is how much slower this one is. It's important to me that you understand I'm not claiming this is a particularly slow format in general, but that compared to triple Amonkhet it's much slower. This puts Hour of Devastation Limited right in the middle, speed-wise. There are absolutely still decks capable of being aggressive, utilizing exert and afflict as well as the usual cadre of combat tricks and removal spells to get the job done. The difference is that you won't face these decks every single draft and that you can explore other options with regard to baseline strategy in the format. A good example would be a card like God-Pharaoh's Gift. In a format as fast as Amonkhet was, even a powerful, colorless card like God-Pharaoh's Gift feels too slow to take over an efficient beatdown card like, say, Oketra's Avenger. 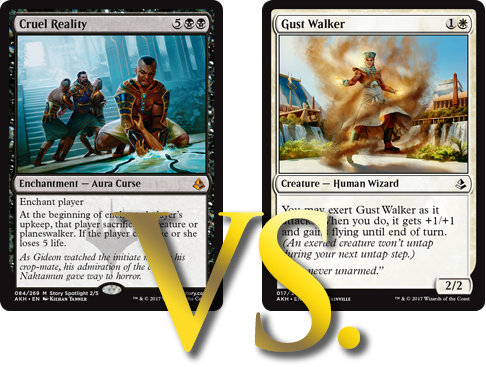 The example I like to use for Amonkhet is Cruel Reality versus Gust Walker. Cruel Reality is a powerful and sweet card, but you wouldn't take it over a Gust Walker if you were serious about winning your draft. The good news is that now you have a reasonable decision to make. You can go for the risky but powerful expensive card or the more reliable but lower-ceiling aggressive card. And I think you can make a case for either pick, which is right where you want a format to be. The players will have to drastically change the way they view the format when they sit down to draft, as the older strategy of just being the absolute most aggressive you could be has given way to a much broader array of options. Let's get into some of the archetypes that the pros will have their eyes out for. Ramp is back, baby! You want to go big? You can certainly do that here. Cards like Manalith, Beneath the Sands, Hope Tender, and Oasis Ritualist help you power out bigger threats more quickly. Oasis Ritualist in particular has stood out for its ability to be played on turn four, then in conjunction with a land drop allow you to play a six- or even seven-mana spell on turn five! Sifter Wurm has been super impressive, especially as a turn-five play. Not only is it positively massive, it has trample so it ends the game quickly and it also can gain you a significant amount of life to help cushion against a fast, aggressive start. Moreover, it sets you up for the long game by letting you put your best cards on top of your library thanks to scry 3. Not bad for an uncommon! These ramp decks are primarily green and require a reasonable mix of ramp spells, midrange creatures, and payoffs to operate smoothly. You still need to do things in the early turns of the game to make sure you don't die to a fast draw from a curve-out style deck. Creatures like Feral Prowler and Harrier Naga do a fine job of mucking up the ground while you set up for your devastating late-game plays. You can also splash quite easily in this deck as many of the ramp spells also double as mana fixing. Manalith, Beneath the Sands, and Oasis Ritualist all do a good job of this, so don't be afraid to splash a great removal spell or bomb. One of the big questions coming in was if the "Deserts matter" subset of cards would actually matter at all. As it turns out, yes, they do matter. The truth is that many of the Deserts in the set are cards you want in your deck regardless of the other payoffs. This cycle of cycling Deserts is plenty good enough to run in your deck no matter what. I would happily run two of these in almost any deck in the format, and in some cases I would even run more. Drawing and cycling one of these instead of a basic land late in the game is a much higher upside than the downside of it entering the battlefield tapped. All of these uncommon Deserts are also playable, or even good in some cases. Ifnir Deadlands has performed well and will be taken early-ish in the drafts, with the others less impressive but still decent. Poor Ipnu Rivulet is much worse than the other four. Sure, I may have gotten summarily smashed by it in the hands of Matt Tabak at the LoadingReadyRun Pre-Prerelease, but I won't be results-oriented enough to think the card is actually good on a game-to-game basis. So you'll play these Deserts regardless of synergies in your deck, but that's not to say there aren't synergies around for them. Sand Strangler is just one of the strongest cards in the set, full stop. The others are totally reasonable payoffs for the Deserts you want to have in your deck anyway. The interesting part comes when the players have to decide when exactly they are willing to pick up the Desert cards in the draft. I've been picking them earlier than I thought I would be—in the pick-four-to-six range. The thing is, if you leave the two Hour of Devastation packs low on Deserts, you are unlikely to get there from the Amonkhet pack as the Deserts in Amonkhet are much worse than the ones in Hour of Devastation. Painted Bluffs is acceptable, but the colorless-only Deserts can be a strain on your mana, and you'd only want to play them if you absolutely had to. The result is that if you are a Deserts deck, you had better pick them up early! My favorite deck and the early frontrunner for best deck in the format in my opinion is Blue-Red Spells deck. It has so many great tools at common as well as powerful payoffs that I think it's very well positioned as a contender in the format. The basic idea is that you are trying to get your opponent from 20 to 0 using an array of attacks, afflict triggers, direct damage, and incidental damage. These are all common creatures and they all have the ability to push through damage in one way or another. The Firebrand Archer is particularly important because you'll be casting a lot of noncreature spells in this deck and you want that incidental damage to flow. All of these interact favorably with the opposing creatures or even the life total of the opposing player. They also all trigger prowess and Firebrand Archer. When you look at the power level of some of the uncommon creatures you can get, you start to really see the strength of this deck. You haven't lived until you've cast an Open Fire, triggered your Spellweaver Eternal and your Firebrand Archer, attacked with your Aerial Guide and another creature, gotten in for a bunch of damage, and then played Bloodwater Entity post combat to set it all up again next turn with that same Open Fire. Between direct damage, afflict damage, incidental damage, and combat damage, you have the tools to win the game pretty consistently. Also, you want to play cards like Strategic Planning and Tragic Lesson so that you can trigger all these cards while also digging through your library for your very best stuff. The deck is very powerful, and I didn't even mention the great payoffs in Amonkhet like Enigma Drake and Warfire Javelineer. The format is slower. Deserts do matter. Ramp decks are real. Blue-red is great. Zombies are still good. Seven-drops are playable. There is a lot going on in Hour of Devastation, and the players at the Pro Tour who have made the necessary adjustments are going to be much better off than the ones who are still clinging to their precious one-drops. Then again, they could just open a God and call it a day. Tune in to find out, and we'll see you from the booth in Kyoto!